Apparently this game is an update of an old arcade classic. It is a good job I did not come across this arcade machine as a teenager otherwise I would have been permanently skint from feeding it an endles supply of 10ps. The aim of the game is simple and yet hypnotically addictive. You control a Destroyer which sails above the screen at the top of the sea. 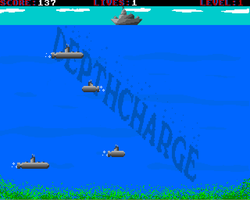 Underneath your Destroyer, submarines appear firing missiles up towards you. The challenge is therefore to avoid these missiles and drop depth charges to blow up the submarines. The game is simple arcade pleasure at its best and is easily worth a few minutes of your time. Despite its lack of depth (no pun intended) there is something about this game which has made me return to it each time I ve booted up my Amiga 1200. It is a classic example of game design when the player didn't have to worry about endless button combinations. The controls are extremly simple, left and right and fire to drop your depth charger. This makes the game instantly accessible and the challenge of blowing up the submarines is surprisingly addictive. Update all the games reviewed are included on the new Amiga CF disk download. I think this game was originally shareware as the disk image I played was an unregistered version. 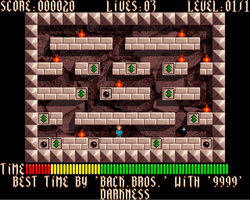 The game is a single screen platform game where the aim is to move your character across the different ledges collecting the bags of money. If you touch a piece of floor which contains a bomb then your character explodes. To avoid the bombs you need to use the transporters. These are represented by the squares with the green arrows. Pushing upwards will transport you to the higher level. Pushing downwards will transport you the lower level. There are also additional items which appear on the screen. I am not sure what they all do but the stop watch acted as a time freeze which is quite handy as each level has a time limit. As I was playing the game I was wondered if the game would benefit from in game music. The lack of music makes the game feel like a puzzle game rather than a platform game. There are sound effects for explosions and when you transport but the lack of music does make the game seem quite pedestrian. Perhaps a tune which speeds up as the time decreases would have added a bit more tension. Overall I enjoyed this game but is one which I will not return to. Crickey, it was difficult to choose a game of the month for April. There are some classic games beginning with D which are not even reviewed, including my favourite Drip, a good Bi Plane combat Dog Fight as well as some arcade classic conversions of Dodge Em and Defender. The game that I ended up choosing was Deluxe Pacman by Edgar Vigdal who is probably more famously known for his Deluxe Galaga Game which he is still working on and updating for modern computers and mobile phones (see interview section for more details about Deluxe Galaga and Edgar's current projects). So why Deluxe Pacman. 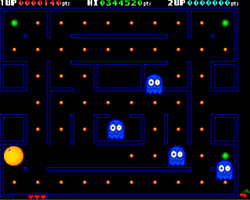 The simple reason is that is a surperb example of Pacman and has been updated to a high standard. The game oozes professionalism in its appearance and game play. The sprites move around with pace and the game has a manic feel to it as you whiz around munching pills and then eating those pesky ghosts. During this months reviews I had one concern when choosing the games which was whether they were rather shallow and lacking long term playability. On the one hand the game play of pacman is very basic and each screen can be completed in minutes. 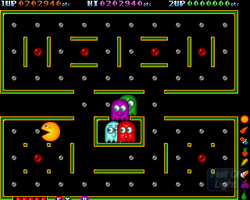 However, there is something fundamently addictive to moving your little yellow character around the screen whilst avoiding the ghosts that made the original such an icon when the original arcade game was released. The fact that the game is still enjoyed today and has been updated for Xbox live means there must be some endearing appeal to the game. Its probably best not to over analyse why games like Pacman and Asteroids have stood the test of time and just load up the disk and enjoy. Video taken from Youtube - uploaded by Crezber.